When and how much to water Lawn? Mother Nature usually provides enough water through rainfall for grass to grow strong. However, there are times when rainfall needs to be supplemented, such as with newly planted lawns or extended periods of heat and drought. Lawn watering plays an important part of lawn care. If you choose to water, wait until the lawn becomes dull green in color and footprints remain visible in the grass. 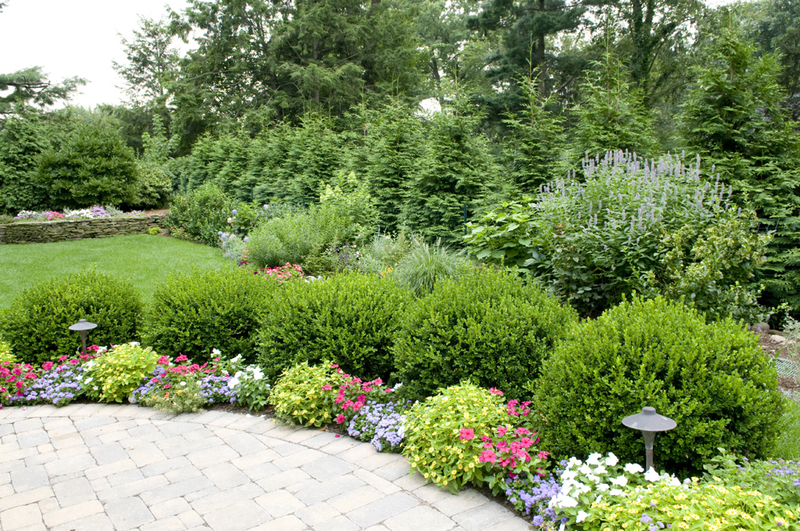 Use the tips below to save on water bills while growing a healthy, beautiful landscape. Soils – Soil texture influences how much moisture the soil can retain, and for how long. This will affect how long it takes to moisten the root-zone, and how quickly the soil will dry out again. Your Plants’ Needs – Some plants need water regularly; others less so. How you water new plants affects root development, which also affects their “thirstiness”. Sun/Shade/Exposure – Sun and shade affects evaporation of water from soil, but how windy or protected a site is affects this as well. Watering System – How fast or slow your system applies water affects how much is actually absorbed versus running off or evaporating. Be sure to water deeply and infrequently. Avoid watering from 11 AM-3 PM, the hottest part of the day. It is best to water between 6-10 AM. There’s less wind, less hot sun, and your lawn has a full day to dry. Watering at night invites mildew and fungus but if you can’t water in the morning aim for around 4-7 PM. In the hot afternoon, much of your water can be lost to wind and evaporation. If you live in the dry southwest, though, the rules are different. There, watering in the evening or night causes less evaporation. Footprints show for a long time. 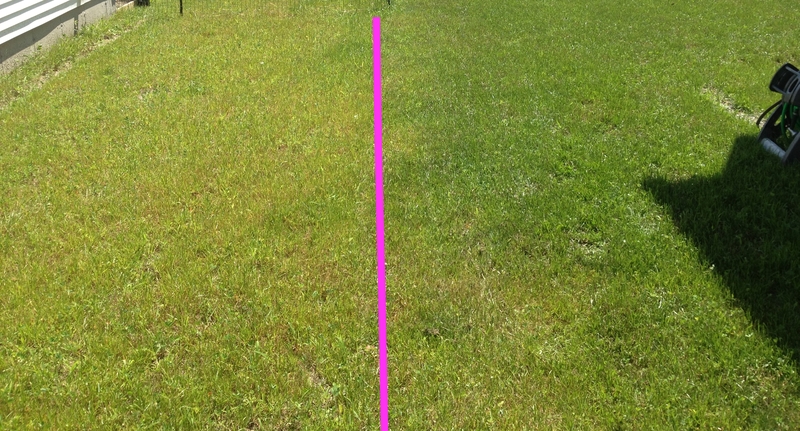 Let lawn areas that don’t get heavy wear go brown and dormant. Just water once a month. In the fall you can thicken any worn areas by raking and then over-seeding. How long can you wait between waterings before the lawn starts to go brown? The fine-leaved fescues (grass blades) as well as the “common” types of Kentucky bluegrasses, such as Park and Kenblue, require less water, fertilizer and cutting than turf-type perennial ryegrass or many of the newer “improved” types of Kentucky bluegrass. 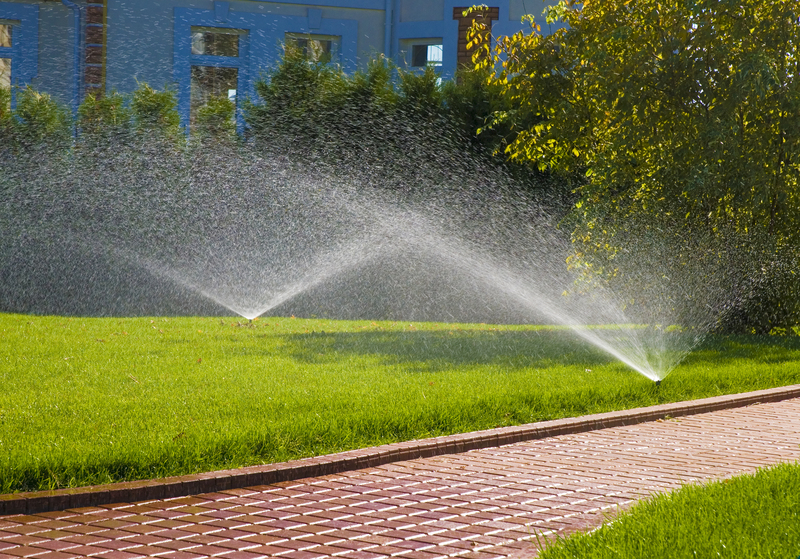 In July, lawns need about 1 inch of water per week, spread over 2 or 3 waterings, to stay green. They need only ½ to ¾ inch per week the rest of the summer (use a tuna can to measure sprinkler output). Watering deeply and less often is generally best, to moisten the whole root zone. Lawns allowed to go brown do best if watered deeply once a month in summer to keep the roots alive. Young trees planted within the last 5 years need water twice a week during the hot, dry summer months. Don’t wait until they show signs of drought stress. Most established trees, if well mulched, need no watering except in drought years. Watch your trees for signs of wilting or yellowing leaves – that means it’s time to water. Trees planted in the fall are more likely to survive our hot, dry summers and will need less water. Young trees planted within the last 5 years need 15 – 20 gallons of water twice a week. Water should be applied directly to the roots. The most efficient way to water young trees is by using a 15 or 20 gallon water bag, filled with a hose. You can set several 5-gallon buckets with small holes drilled into the bottom around the base of the tree and fill those with water. Water mature trees, if necessary, once or twice a month. 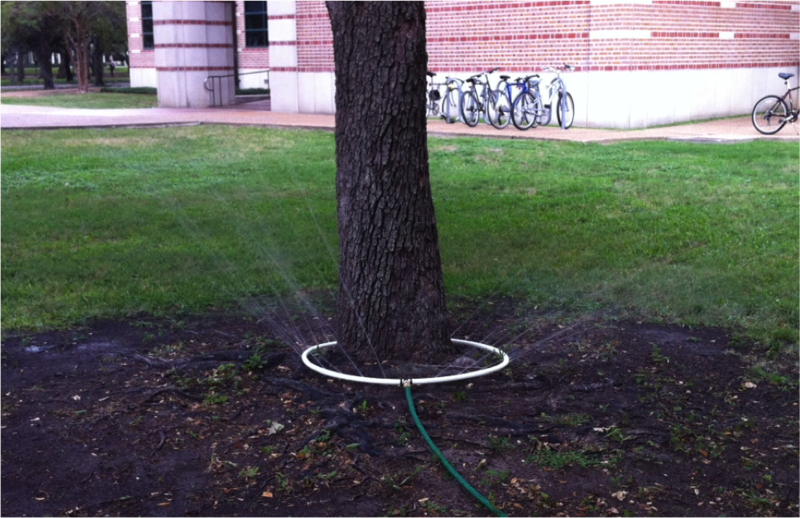 Place a soaker hose circling the tree toward the edge of the canopy, NOT at the base of the tree. Use a hose faucet timer to prevent overwatering. Varies widely by plant (see above). Many established plants need little or no summer watering, so become familiar with your plants’ needs. Look for wilted leaves that don’t perk up in evening, deciduous leaves that are yellow before autumn, or evergreen leaves that are dull or bronze. Water deep enough to moisten the whole root zone (6 to 12 inches). Dig into the soil before watering to see if water is needed, and an hour after watering to check for adequate moisture. Soil is dry below the surface. 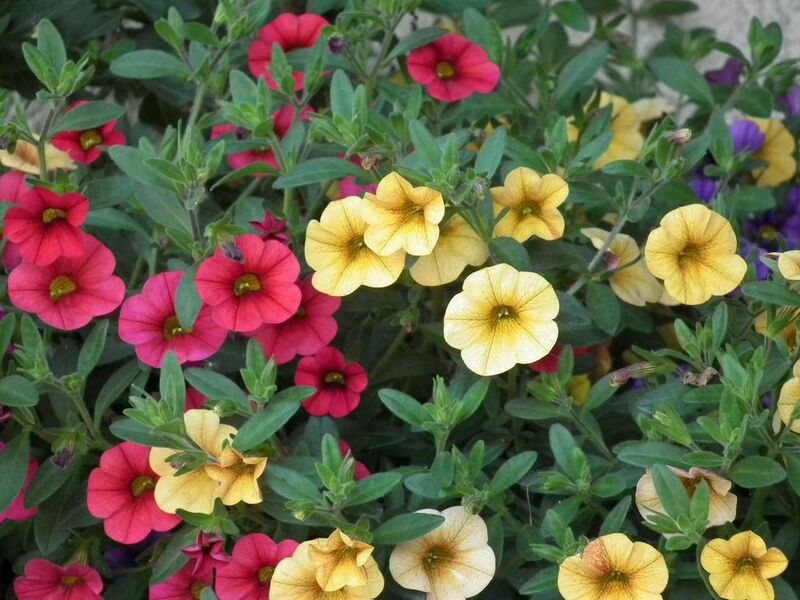 Try not to let annuals wilt – many will be stunted or die if allowed to dry out. Check the soil often to make sure it’s moist 1 or 2 inches below the surface. Check the soil before you water. Probe with a finger of trowel to see if the soil is still damp a few inches down. When it’s dry down at the root zone, it’s time to water. Water deeply, but less frequently. An hour after watering, check the soil again to see if the water has reached the rootzone. Adjust your watering time to moisten the whole root zone, but then wait until the upper few inches of soil are dry before watering again, which encourages deeper roots. Water slowly to prevent surface runoff and give water time to penetrate. If water puddles on the surface before it is absorbed by the soil, start and stop your watering several times, as needed, to allow the water to soak in. Get water right to the roots, by using a watering wand, with a shutoff, for small areas. For larger areas, drip irrigation or soaker hoses, under mulch, deliver water efficiently right to the roots.